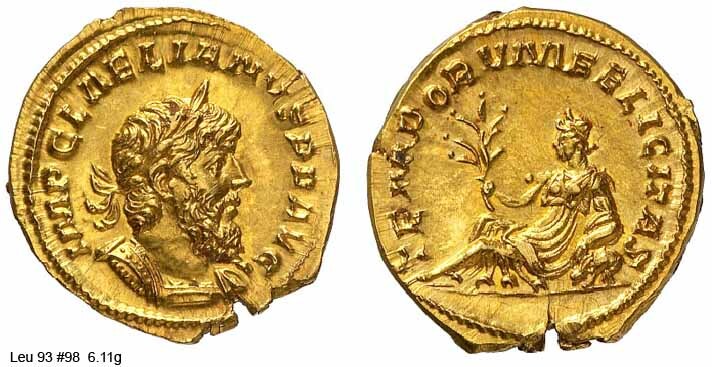 269 Laelianus was a usurper against Postumus, himself another usurper, who was unable to rout the incumbent when their forces met in battle. Laelianus thus had a tenure lasting from near the beginning of the year 269 through no later than that summer. Because of this short time there was little time for him to make much of a mark on history. His coins, however, are much sought after for their rarity. All of the coinage from the Gallic secessionist emperors have portraits that are more or less interchangeable and bear a resemblance to Santa Claus. RIC 1, CalicСѓ 3801, C 2 Aureus Obv: IMPCLAELIANVSPFAVG - Laureate, cuirassed bust right. Rev: TEMPORVMFELICITAS - Hispania lying left, holding branch and resting arm on rabbit. June - July 269 (Colonia Agrippinensis). $167,398 5/10/05. 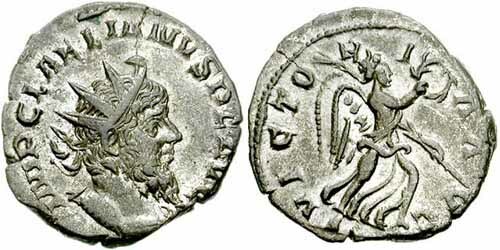 RIC 9, C 4 Antoninianus Obv: IMPCLAELIANVSPFAVG - Radiate, cuirassed bust right. Rev: VICTORIAAVG - Victory advancing right, holding wreath and palm. $1,300 9/22/04.